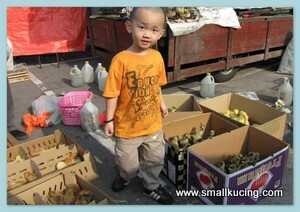 Last weekend we went for Dim Sum at Sg Buloh New Village again. Mamarazzi spotted an old man selling Chicken at the Pasar and brought me over to see. Caught you!....errr...no ..I don't....Don't runnnnnn..
Guai guai leh..Go back inside the box. Wow...got botak chickadee...the neck no feather one. Like me lah. Me botak on the top. My daughter loves them too...when she was small. chau kai.. not tau kai ok la! hahaha... your mama got go curi ayam or not? 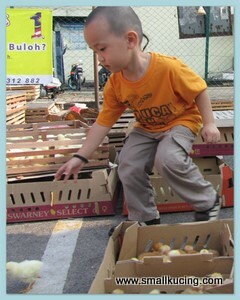 so cute....your boy is so brave to catch the chicks. I still remember a few years back, pasar malam got sell those colorful chicks....they dyed the yellow chicks into orange, purple, blue, green, etc.... so kesian. Nowadays, never see those chicks anymore..thks god! Small Kucing catching Chickadee so worried might step on it alive..oh dear cold sweat! Wah SK so daring.. I also don't dare to pick up those chicks.. scared of them biting. LOL! I love the pictures. So cute! 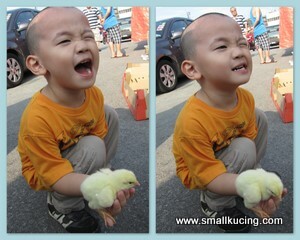 I can see your son having a good time with the cute looking chicks. So cute. I love this post! Our grandchildren had chicks now they are chickens. They get the eggs every morning before school. Hugs and wishes for a joy filled weekend. I like to see his facial expression when he holds the chick in his hand! VEry cute! Hahaha....this reminds me of last time during my childhood, my mum used to buy chicks to rear until big-big and then sembelih makan! Nowadays I don't see shops selling chicks anymore. Apparently sini ada. THanks for sharing. Hi, Every time I see your blog, looks more professional and nice. Your kids are so cute. Hey thanks for being my regular visitor. I love and appreciate your visit every time. A local store in town has chicks sometimes and my kids just love to look at them and touch them. So cute! 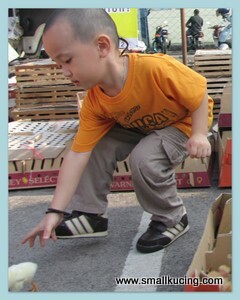 As always, your little guy is so adorable!! Eh better not la...later will have emotional stress pulak. Big liao how? Slaughter ah? Sure the kids going to cry. Just go see see enough lo but it not open every weekend. AH! The small chic look so so cute!! Bring back my childhood memory. 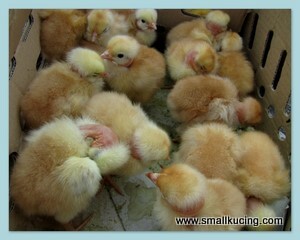 I am sure my boys will get exciting if they see all these small chics.